The news today is filled with fatalities in every spectrum of natural or induced deaths. The direct impact is on the men, women and children whose lives are lost or taken. Animals, although rarely reported are also casualties in many major fatal catastrophes involving the destruction of homes or the environment. Human demise is seldom disregarded because newspapers publish obituaries of even unremarkable people whose lives have met their conclusion. Individuals with notorious reputations or uncommon distinction are considered newsworthy and will materialize on page one. Death is considered a permanent state of being except for the memories and thoughts that certain people bring to our recollection from time to time. 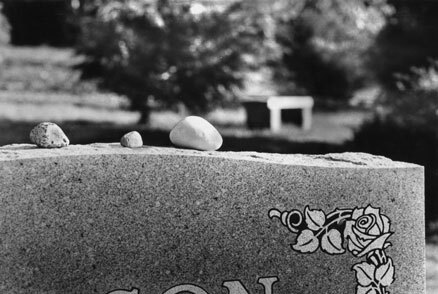 Most of us visit the grave site of family members and friends on particular days of the year that are significant to a departed person's identity such as birthdays, anniversaries or date of death. Most often prayers are said, past memories recalled and flowers or potted plants are left behind as a sign of everlasting affection. At the enduring Point Robert's Cemetery some of the visitors have left behind shells or rocks to record their sentimental journey.